Companion Animal aims to meet the clinical needs of veterinary surgeons in practice who care for small animals and exotics. 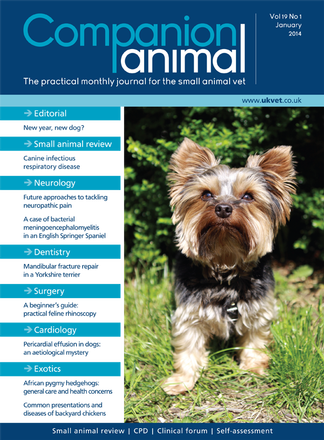 The journal is authoritative and accessible, and has become one of the best-read publications for veterinary surgeons wanting to keep up-to-date with clinical developments that enhance their practice. Companion Animal provides regular clinical updates, visual surgery and case studies for CPD assessments. A highly respected veterinary surgeon, consultant editor Carl Gorman understands the needs of veterinary professionals in practice. Be the first person to tell us what you think about Companion Animal and you'll save £2.50 on your next purchase!